The Model AS-15 Capacitive Fuel Quantity Measurement System Trainer is a fuel quantity measurement system using real aircraft parts. 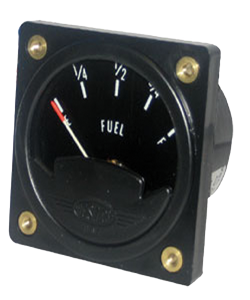 The system comprises of a fuel tank, capacitive probe and a fuel quantity indicator. The students can perform hands-on tasks like fuel probe calibration, and system maintenance. Easy Push Button Calibration - Simple push buttons make calibration easy and accurate. No sensitive screw adjustments to make. Place the probe in tank,connect power and press EMPTY. Fill tank and press FULL. Calibration is complete. Steady Readings - Digital filtering minimizes the effects of fuel slosh providing greater accuracy. Proven Design - Designed specifically for the aircraft that are subject to harsh environments, such as vibration, temperature, and electrical noise. Probes designed for industrial applications can fail under these conditions. Proven reliability with over 4 years of history. No Moving Parts - There are not any parts to wear out.Will not require future maintenance or replacement. Unique Press-fit Installation - Can be mounted in plastic tank by drilling a 1/2" hole. A rubber grommet is used to hold the probe in place. Standard SAE 5-Hole Bolt Pattern - A backing plate and seal are used to secure the probe to the tank.